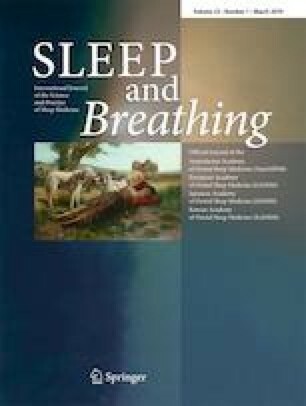 Obstructive sleep apnea (OSA) has been estimated to affect 4–11% of the population and causes systemic inflammation which leads to metabolic syndrome (MS). Non-alcoholic fatty liver disease (NAFLD) is also associated with MS whether NAFLD is an additional risk factor for the systemic inflammation that occurs in OSA is unclear. In this study, we aimed to analyze the association of OSA and NAFLD with MS and systemic inflammation in Asian Indians. Total 240 (132 males and 108 females) overweight/obese subjects [body mass index (BMI > 23 kg/m2)] were recruited; of these, 124 subjects had OSA with NAFLD, 47 had OSA without NAFLD, 44 did not have OSA but had NAFLD and 25 had neither OSA nor without NAFLD. Severity of NAFLD was based on abdomen ultrasound and of OSA on overnight polysomnography. Clinical examinations, anthropometry, body composition, metabolic parameters, and inflammatory biomarkers were recorded. Serum levels of leptin, macrophage migration inhibitory factor (MIF), interleukin-6 (IL-6), high sensitive C-reactive protein (Hs-CRP), and tumor necrosis factor alpha (TNF-α) were significantly higher, and adiponectin levels were significantly lower in OSA with NAFLD subjects. Prevalence of MS was significantly increased in OSA and NAFLD subjects (p = 0.001). There was a strong association and correlation between leptin, IL-6, Hs-CRP, MIF, and TNF-α in OSA and NAFLD subjects. Multivariate logistic regression showed that OSA was positively associated with the NAFLD [odds ratio (OR), (95% confidence interval (CL) 3.12 (2.58–7.72), (P = 0.002)]. NAFLD is an additional risk factor in OSA subject which contributes to systemic inflammation in Asian Indians. The online version of this article ( https://doi.org/10.1007/s11325-018-1678-7) contains supplementary material, which is available to authorized users. The authors acknowledge the contribution of Mr. Kirti Pratap who performed many of the biochemical investigations. Finally, the cooperation of the subjects who took part in the study is greatly appreciated. Funding for this study was provided through the Ministry of Science and Technology, Department of Science and Technology (Ref: SR/SO/HS-0146/2010), Government of India. The sponsors had no role in the design or conduct of this research.